When I was teenager, I had a keen interest in the story of the Titanic. I was particularly captivated by the tale of the two wireless radio operators, Jack Phillips and Harold Bride, who manned their stations until the very end, tapping out messages in Morse code. 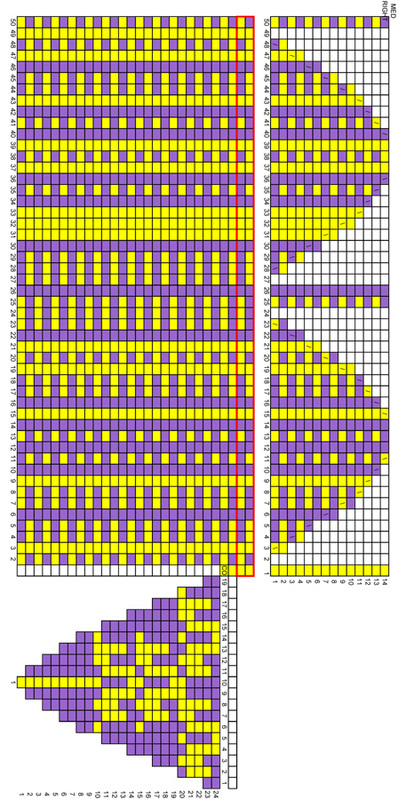 Earlier this year, I was doing some research on traditional Fair Isle patterning, and after days on end of looking at charts, I realized I was starting to treat everything as dots and dashes. I did a bit of googling, and realized that the rules of Morse Code lent themselves very nicely to Fair Isle. So, why not mittens with messages on them? In code! 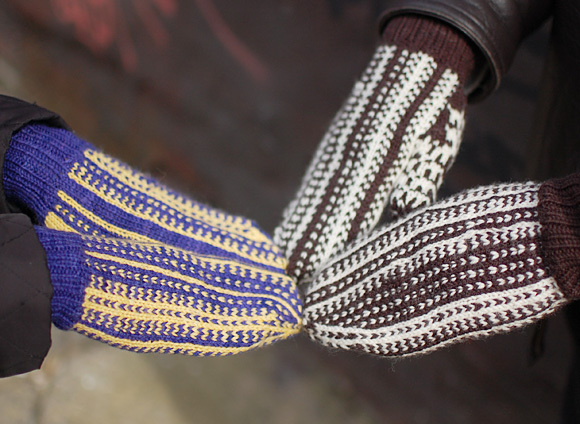 Each mitten clearly identifies which hand it is to be worn on, and the thumb says, simply enough, “thumb”. Want to change the message? Here you go. Note: Two circular needles or one long circular needle (with magic loop technique) may be used instead of double-point needles. When working charted color pattern, be sure to keep yarn floats at WS of work loose. All Rounds: [K2, p1] to end. The thumb charts all read "thumb". Using smaller needle(s) and MC, CO 39[39, 42, 45, 51] sts. Divide sts between needles and join to begin working in the round, being careful not to twist. Work in 2x1 Rib until cuff measures 3 inches. After the first few rounds have been worked, place safety pin or split ring marker in work to indicate beginning of round. Size XS (Right mitten only): [Work 6 sts in pattern, m1, work 7 sts in pattern, m1] three times. 45 sts. 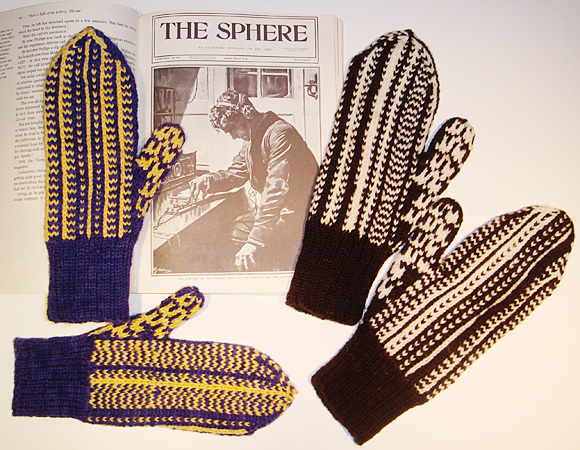 Size XS (Left mitten only): [Work 6 sts in pattern, m1, work 5 sts in pattern, m1] three times, work 6 sts in pattern, m1. 46 sts. Note: From this point on, stitch numbers for size XS will be shown as [right hand/left hand] when numbers for two hands are different. Size S: [Work 4 sts in pattern, m1, work 5 sts in pattern, m1, work 4 sts in pattern, m1] three times. 48 sts. Size M: *[Work 5 sts in pattern, m1] three times, work 6 sts in pattern, m1; repeat from * once. 50 sts. Size L: [Work 5 sts in pattern, m1] nine times. 54 sts. Size XL: [Work 7 sts in pattern, m1] twice, work 8 sts in pattern, m1, [work 7 sts in pattern, m1] three times, work 8 sts in pattern, m1. 58 sts. Change to larger needles. Work Round 1 of Body Chart for your size and hand, placing stitch markers before and after first st to indicate placement of thumb gusset sts. 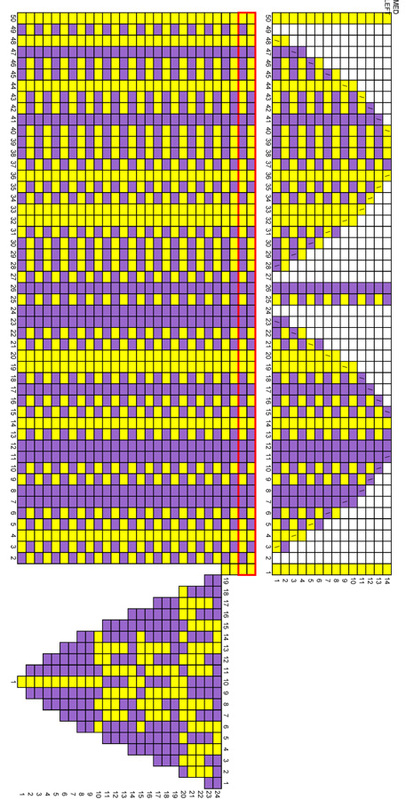 Continue in pattern, shaping gusset as shown, until you have completed Round 18[20, 24, 24, 26] of chart. 59/60[64, 68, 72, 78] sts. Remove marker(s) when working next round; leave end-of-round marker in place if desired. 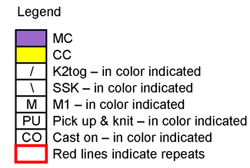 Next Round: Place first 15[17, 19, 19, 21] sts (all sts between markers) on waste yarn, CO 1 st using backward loop method in color shown, continue following next round of chart. 45/46[48, 50, 54, 58] sts. Continue in pattern, repeating last two rounds of Body Chart, until work measures 1.5[1.5, 1.5, 1.75, 2] inches less than desired length to top of hand. End with last round of Body Chart. 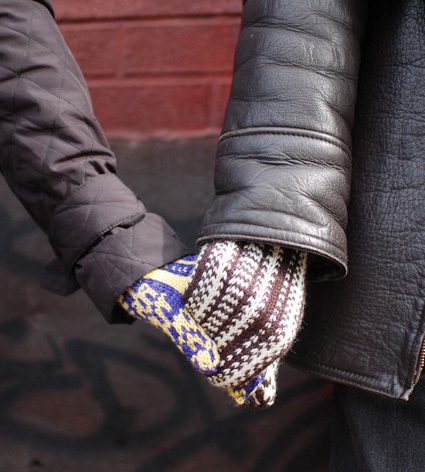 Note: When measuring length of mitten, try on mitten and measure along side of hand above thumb opening. Work all rounds of Decrease Chart for your size and hand. After final round, cut yarns, leaving 6-inch tails. Draw tails through remaining sts to secure. With RS facing, rejoin yarns at CO edge of thumb opening. Place held sts on needles. Following Round 1 of Thumb Chart for your size, pick up and k 1 st in space between CO st and held sts; work held sts in pattern, pick up and k 2 sts in CO edge. Divide sts between needles and join to work in the round. Work all rounds of Thumb Chart. After final round, cut yarns, leaving 6-inch tails. Draw tails through remaining sts to secure. Weave in ends and block. You don't need any special tools - just get the mittens soaking wet, roll them in a towel to wring them out, and put them on. Take them off again immediately, and hang them to dry. 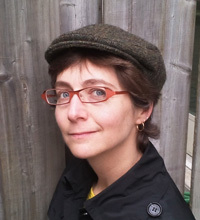 Kate is Knitty's technical editor for socks. She has a passion for clever knitting techniques and clever projects. You can see more of her work here. She may well be slightly geeky.